You've heard of them, you've seen photos of them, maybe you've even watched a documentary about them, but there's nothing like walking up to the 19' 3" monument and reading the Georgia Guidestones in person! The Georgia Guidestones were dedicated on March 22, 1980. 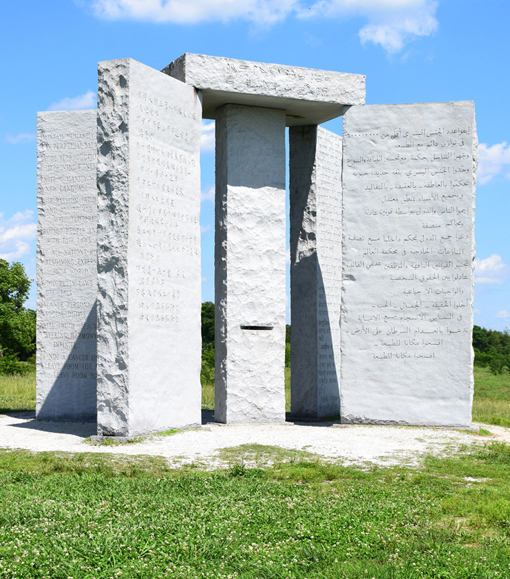 Sometimes called the American Stonehenge or Stonehenge of Georgia—for its astrological features—the Georgia Guidestones' origin and conservation message to this day remain quite shrouded in mystery. The Georgia Guidestones are located at a remote site, on the highest point in Elbert County, the County being the owner of the Guidestones. On a Friday in June 1979, a stranger identified as "Mr. Christian" (later "R.C. Christian") met with Joe H. Findley, Sr., President of Elberton Granite Finishing Company, indicating that he represented a group of loyal Americans from outside of Georgia who wanted to build a monument focused on the theme of conservation. Seeking a financial institution for the project, Findley sent "Mr. Christian" to Wyatt C. Martin, President of the Granite City Bank, which would hold the funds to build the monument in escrow. "Mr. Christian" explained that he and his colleagues selected Georgia as the site for the monument because of its excellent granite, its moderate climate and because "Mr. Christian's" great-grandmother was a Georgia native. There's more...so much more! A lot of research has gone into the Georgia Guidestones, and there's even a movie, and there's potentially a significant amount of additional research that could be done. As they say, "time will tell" if that happens. 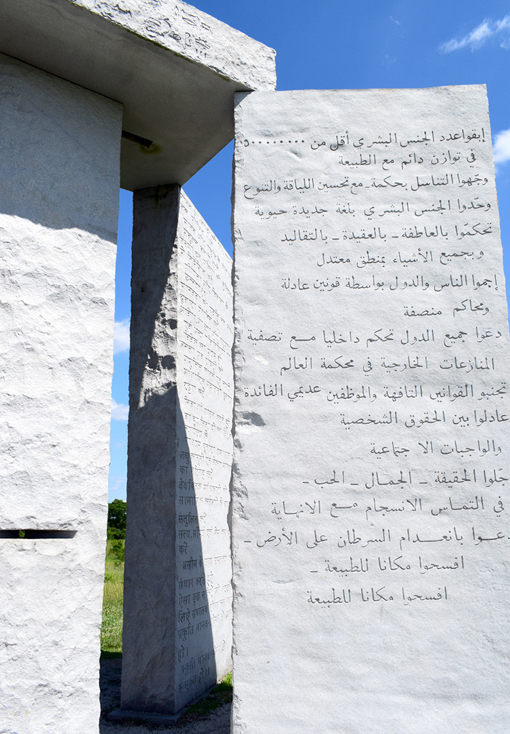 The Georgia Guidestones have brought contentious debate, lofty conversation, and more than marginal controversy. People have explored controlling human civilization since at least 400 BCE when Plato suggested selective breeding. The Georgia Guidestones waste no time getting to their ideas for the "conservation" of humankind, starting with keeping the population under 500,000,000, perhaps the most controversial of the 10 guidelines. The Georgia Guidestones, to me, are part commandment, part advice, part common sense, and there are some that are blatant humor—probably not on purpose, but surely the author couldn't have imagined 2018 society in 1980....or maybe he could. That last line is not a typo. "LEAVE ROOM FOR NATURE" is indeed etched twice. 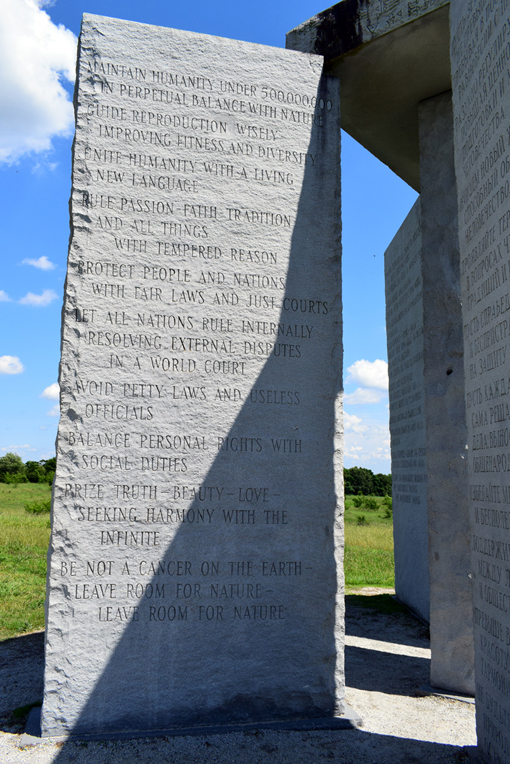 Some believe the actual purpose of the Guidestones is simply to protect our planet. "AVOID PETTY LAWS AND USELESS OFFICIALS"...LOL, right? The astronomic features of the Georgia Guidestones are noted on another granite slab, laid in the ground, only a few yards west of the Guidestones, marked with N, E, S, W, on the corresponding compass directions. "...the four main granite slabs were aligned with the celestial poles, while the centre stone was drilled with an eye-level hole oriented with the North Star and a slit aligned with the Sun's solstices and equinoxes. The capstone, having its own slit, was to act as a calendar, revealing the date at noon each day when the sun shone through." 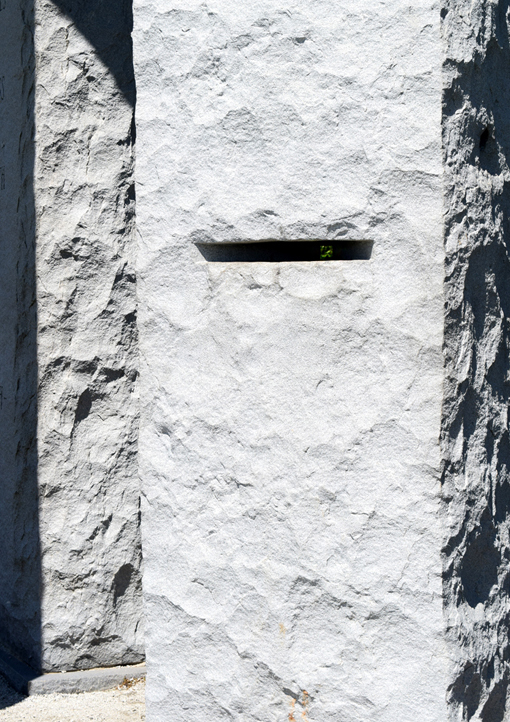 The cool-factor that this adds to the Georgia Guidestones is off the charts, and it equally adds to their mystery. But seriously though, what do the solstices have to do with the conservation of humanity after the apocalypse? That's assuming we're not meant to cut today's population to "under 500,000,000". 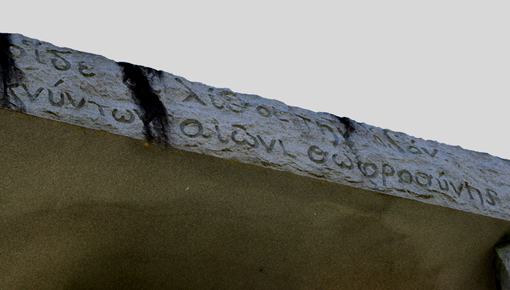 Adding even more mystery to the Georgia Guidestones, this same slab notes that there is a time capsule buried six feet below the slab and that it was placed on ______ and is to be opened on ______. That's right...no dates are etched! 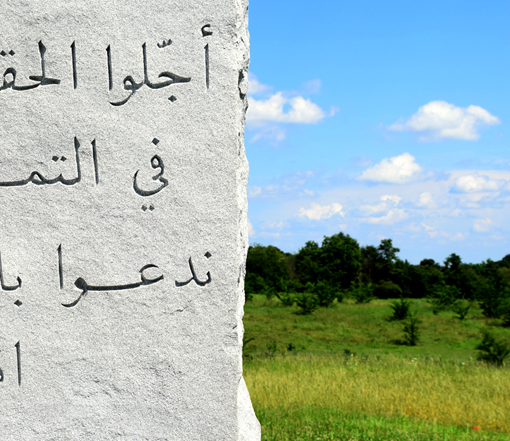 The rectangular capstone is inscribed with "Let these be guidestones to an age of reason" in four ancient languages. In clockwise order starting with the Guidestone carved in English, the capstone languages are Babylonian Cuneiform, Classical Greek, Sanskrit and Egyptian Hieroglyphics. 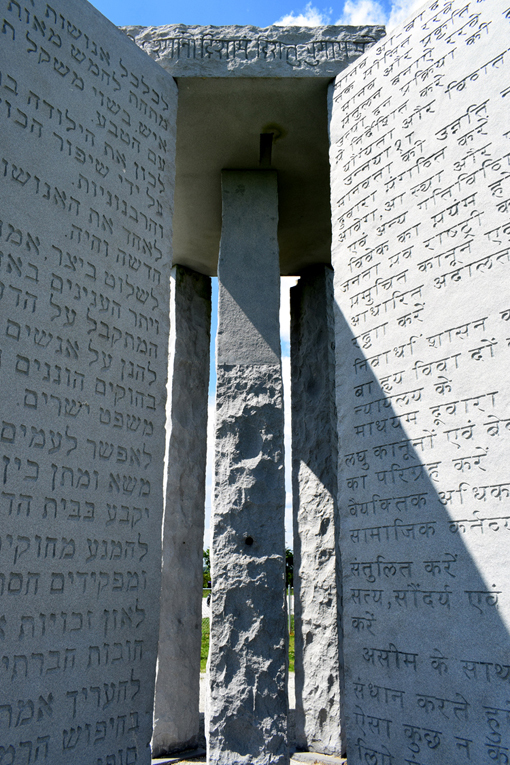 On the vertical standing slabs, the Guidestones, the same 10 guidelines are etched on both sides of the four monoliths, each side in a different language. In clockwise order starting with the English inscription, the eight languages are English, Spanish, Swahili, Sanskrit, Hebrew, Arabic, Chinese and Russian. Interested in linguistics since I was a teenager, I'd love to know the thought process behind the selection of this particular collection of languages. 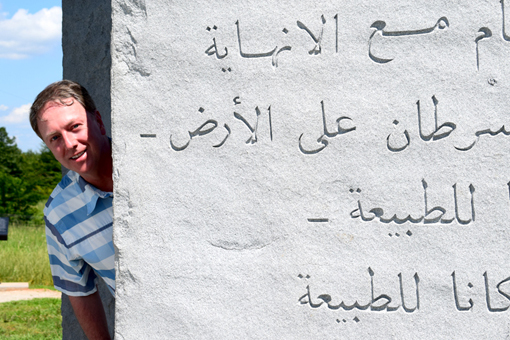 And why was only one language used on the capstone and the Guidestones...why that language? The above photo is only for proof that I was actually at the Georgia Guidestones. It was a HOT and HUMID day, but I wouldn't have traded it for anything else. It was a great day...sweat and all. I went with my friend Wayne, a State Parks and State Historic Sites expert. Our last excursion was great fun and who knows where we'll go next! Behind me on the left you can see the edge of a marker that shares a little history about the Georgia Guidestones. It was placed some time after the 1980 dedication of the Guidestones and was not authored by "R.C. Christian". While we were there, a couple arrived with drone in-hand making me super jealous, but all the same excited about what they were doing. There were no personally-owned drones in 1980, so aerial photography and videography had to be done by helicopter or plane...not an everyday occurrence four decades ago. The husband and wife team were making photos of each other and my friend Wayne offered to make a photo of them together, an offer they happily accepted. I love it when that happens and it saddens me when people say, "No thanks". Just think of all the amazing photos people are missing out on! 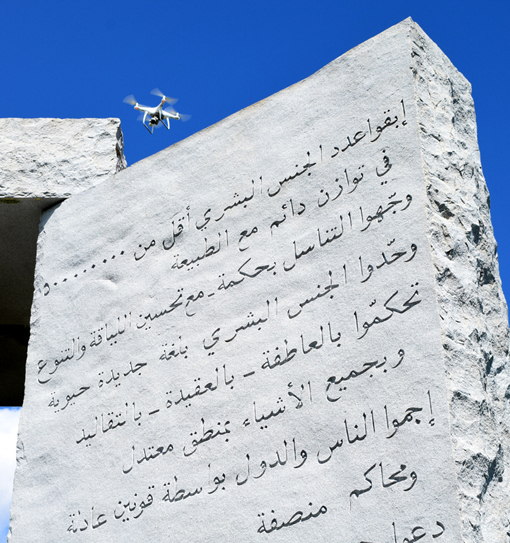 Not too long later, after hearing him telling someone else that there were no etchings on the top of the Guidestones, I asked if they were going to publish the drone video. Sure enough, they were! And they did! Check it out here. We had met Wesley Hall and wife and they were absolutely delightful! His website, Wesley Hall, has the awesome tagline of "urban drone pilot and aerial photographer | digital analytics pro"...do check him out! Just gotta say, a simple "Hello" or "Would you like a photo together?" can lead to anything from a delightful encounter to a lifetime friendship. Give it a try! Like the diverse languages on the Georgia Guidestones, the visitors when we went were also incredibly diverse...it was awesome! There were bikers, gays, younger, older, and people of every skin tone and ethnicity you can imagine...for such a small footprint, it felt like we were on a United Nations field trip...all the representatives curious about the guidelines for the planet's future! Elberton, Georgia is only two hours northeast of Atlanta. Being the tourist I am—and at Wayne's recommendation—we made it a triple tour. We had lunch at The National in Athens, one of celebrity chef Hugh Acheson's restaurants; then we went to Watson Mill Bridge State Park, made some photos and hiked a bit; and then we went to the Georgia Guidestones. We made a day of it and what a fun day it was! The Georgia Guidestones are out in the country. You can see them from the street, but they're also set against picturesque countryside, and there were a couple of donkeys in an adjacent pasture. It's a beautiful setting and you can get quite a few photos without the nearby telephone poles and wires. FYI, the site is under video surveillance, so don't do anything you wouldn't want your mother to see on the 6 o'clock news! 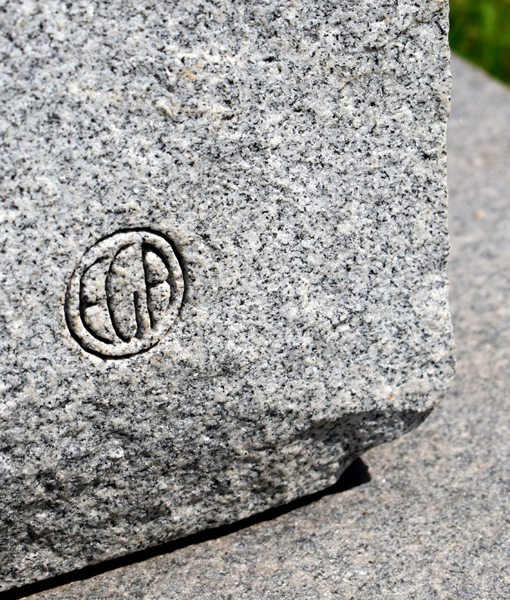 Some of the stones have etched into them "EGA" enclosed with a circle, representing Elberton Granite Association. It might be etched on each of them, but I was too distracted by the whole of the Guidestones experience to investigate beyond seeing a handful of them. Elbertton, Georgia is dubbed "The Granite Capital of the World". The town is only four square miles, but boasts approximately 45 granite quarries! Elberton Granite Association even created the Elberton Granite Museum, so be sure to stop by there, too! You'll have to visit to make your own assessment, but some believe that the Georgia Guidestones are an elaborate hoax to increase tourism to Elberton, Georgia, which they have—and some believe that they're exactly what they claim to be—guidelines for the conservation of humanity. First off - thank you for your kind words about meeting my wife and me. It was truly our pleasure. Secondly, congratulations on another fantastic article filled with stunning pictures. Any jealousy you had seeing my drone pales in comparison to how I feel looking at your pictures. I can't wait for your next installment! Keep up the good work.